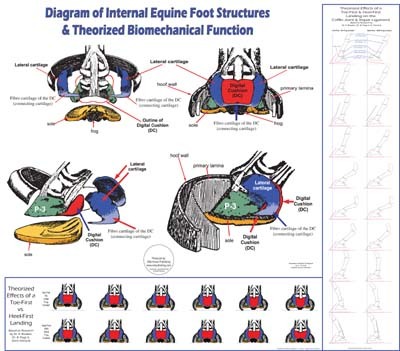 This full color laminated poster is an excellent tool for illustrating the inner workings of the equine foot. Along with the 3-D model of the basic internal structures of the foot, it shows both a soft-tissue and a skeletal diagram of the effects of a toe-first vs. a heel-first landing. These illustrations and diagrams make it easy to understand the possible causes of hoof pathologies such as Navicular Syndrome & heel pain.